North Shore Aluminium is proud to announce that we are the leading company for the manufacturing and installation of flyscreens. All of our fly screens are made from either powder coated or anodized heavy duty extruded frame and are fitted with a choice of either fiberglass, aluminium or stainless steel mesh. The fly frames that we use are available in both 9mm and 11mm to suit all types of windows. Our flyscreens are available in a wide range of colours and they all have a smooth face which make them easy for cleaning. Our experienced staff will guarantee that the fly screens we install maintain a total seal around the window – ensuring no gaps. We manufacture our insect screens for ALL TYPES OF WINDOWS AND OPENINGS. SO…IF NO-ONE CAN DO, WE CAN !! 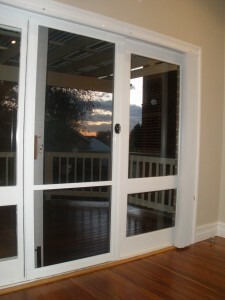 Insect screen doors are custom made and available in both hinged and sliding, ensuring an excellent fit with no gaps. They are manufactured using heavy duty security door frame (68mm x 18.5mm) and are available in either a powder coated or anodized finish. They are then fitted with a choice of either fiberglass, aluminium or stainless steel mesh. A centre rail (optional) is available on all our flyscreen doors to provide extra stability. – A bug seal which is fixed to the back edge of the door which ensures a tight seal between the flyscreen door and glass door. – Top and bottom track can be installed if required. – A keyed Whitco deadlock is used on all our flyscreen doors as they are a more positive lock than the standard non keyed A-latch used by other door competitors.